You are entering a very interesting time in your earth’s existence. You are the holders of the energetic space that is needed for the full transformation of consciousness. Many of you are feeling the upheavals that are coming with this transition, and we are here to tell you that there is more to come. For the new energy to transition into full alignment, the old has to fall away… but since energy is neither created nor destroyed the old energy must be transmuted. Be careful of what you are holding onto and what you are giving your attention to. You focus needs to be on aligning with what brings you the most joy, abundance and happiness. Create balance, so much more exists beyond the struggle, do NOT get trapped in the struggle. Your guides and higher extensions of consciousness are assisting many of you in this time. Take time to slow down, to disconnect from the distractions of this 3D space. Your technology is designed to bring you into contact with one another at lightning speed. The flow of information is moving all of you faster into alignment, but you are moving so fast that you are NOT aware of the illusion you are getting trapped. Be still. Talk to one another. Write Letters. Connect through eye contact. Be present with one another. Do not take for granted to beauty of interpersonal human connection. You are unique beings that grow through touch, sensation and much more than a machine will be able to give you. You are loved. You are Beautiful. You are Divine Beings Of light. Halloween tends to be a time that brings an allure to what lies just out of the normal scope of reason. The veil between worlds is said to be at its thinnest, and for many the desire to reach through is enhanced. 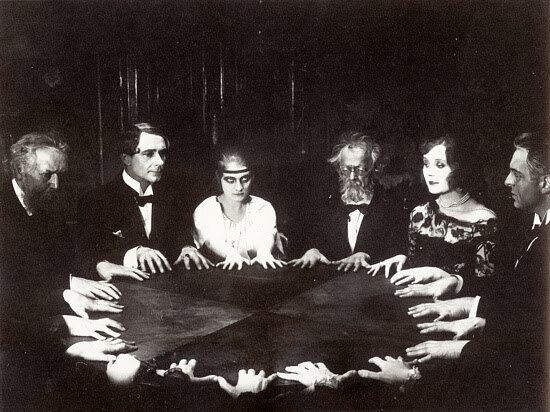 A seance is one method that people use to collectively reach through to connect to those on “the other side”. There are a variety of books that give process and detail the “how-to” for spirit connect, but I am going to share my personal process for connecting and doing it safely. Anytime we open up to spirit we want to enter this space through protection. Spiritual protection can simply be reciting a prayer before starting, smudging the space and self, or creating boundaries with stone (onyx, black tourmaline, or hematite). Entering in through protection allows us remove fear from the process, it allows us to engage the connection through a place of love and openness. If you are doing this in a group setting it is important to be sure that everyone is engaging in the protection for the event. Creating a group dynamic of protection keeps the intent set for love and a positive connection on all sides of the veil. After you engage in opening up to your protective work, you’ll want to set up sacred space and set and intent for the connection. A lot of people assume that seances are solely used for contacting those that have crossed over. You can open up to the energy of guides, angels, guardians, or your higher self. Set the intention for the event. Set the desire to open up to those external energies and then allow that intention to drive the event’s energy forward. If there are loved ones that you wish to connect to set the intention to allow their energy to come through. One way to do this is to have an object of theirs, a photograph, or their name on a piece of paper. Focus tools allow you to deepen the connection of the experience and to call their energy in directly. You can sit in a circle, or just create a relaxed environment that everyone feels comfortable in. Once you begin the session, trust is the next stage you have to enter. We have to trust that when we engage the process, that we are allowing this flow of information, energy and love to occur between our dimension and theirs. Some people use spirit boards, automatic writing, pendulums, tarot cards, or just opening up your natural senses to the space. A lot of people assume that they will get profound messages, but you have to be open to sounds, smells, sensations as well as anything vocal that might occur during the session. Be sure to keep notes of what you are feeling, thinking, seeing. Sometimes the message is in the process of opening up, inviting in our loved ones, and sharing in the energy of the moment. We often forget about those connections until holidays or other events connected to the passing. They are with us when we need them, just a heart beat away. To close the session, thank those that have stepped through. Thank the energy, the divine, and sit in the energy of the experience. Also remember you don’t have to wait until Oct 31st to connect, and you don’t need a medium to reach through. We all have the power of connection, and everyday is sacred.